The Japanese are experts at urban landscaping, and one of their most superb examples is Kyoto’s Golden Pavilion, also known as Kinkaku-ji, formally known as Rokuon-ji or “Deer Garden Temple”. The Golden Pavilion was built in 1397 as a retirement villa for the ruling shogun, Ashikaga Yoshimitsu. After the shogun’s death in 1408, his son converted Kinkaku-ji into a Zen Buddhist Temple. Today, it’s famous for two reasons. It’s covered in gold leaf and it houses sacred relics of the Buddha. Kinkaku-ji is encompassed by an impressive Japanese strolling garden (kaiyū-shiki), while the heavenly beauty of the pavilion is reflected in a clear pond called Kyōko-chi (Mirror Pond). The Buddhist creation story is said to be represented by the islands and stones on the pond, and the forest surrounding it makes it one of Japan’s most picturesque settings. Consequently, it became a prized subject and continues to provide inspiration for countless Japanese artists. In 1994, the pavilion became a World Cultural Heritage site. Today, it draws tourists from all over the world. This visually-arresting three-story building is very unusual, both inside and out. It is unique for two reasons. Its upper floors are covered with gold leaf on Japanese lacquer, and each floor reflects a different architectural period of its time. The first floor is designed in a palace type style of architecture from the tenth century, called Shinden-zukuri. The second floor is Buke-zukuri, the architectural style of the samurai. The third floor is decorated in Karayo style or Zen temple style. In 1950, disaster struck when The Golden Pavilion was burned down by a novice Buddhist monk. In 1955, Japanese architects followed its original design to reconstruct the pavilion. The only major change they made was to increase the amount of gold leaf applied to the Golden Pavilion’s exterior and interior. The present-day structure dates from 1955. In 1987, a new coating as well as gilding with gold-leaf was added. The roof was restored in 2003. 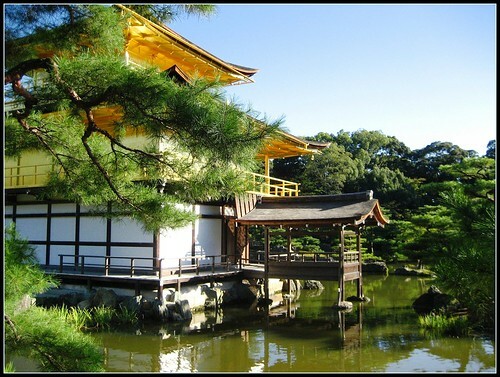 The Golden Pavilion is often linked with Ginkaku-ji, the Silver Pavilion Temple, which is also located in Kyoto. By bus: Take bus number 101 or 205 from Kyoto Station. Nearest bus stop: Kinkakuji-michi or Kinkakuji-mae. By subway: Hop on the Karasuma Subway Line to Kitaoji Station. Then take a bus or taxi to the temple complex. Golden Pavilion Tours: Organised guided tours are available in English to the Golden Pavilion. Thanks for the post on Kinkaku-ji! The picture is gorgeous. It looks like it was a beautiful day when you went. When I was there, it was a very rainy and overcast day. But it was still a beautiful place to visit. Anyways, I was just wondering if you meant to post the same picture twice? Lovely shot, makes me want to visit Japan again. Me, too. It’s hard to believe it’s been over a year! I never realized you visited Kyoto, I thought you just dropped by Tokyo. I visited Kinkaku-ji in October, the weather was just as nice as on your photo. I was impressed with the shiny-ness (if that’s even a word) of it all, the temple was just as shiny and gold in real life as in pictures, I loved it. I also bought souvenirs here for my family, those temple amulets for good luck and good health. My Japanese guide claimed that they “really worked!”. I’ve been meaning to visit Japan, this just adds the urge to. 🙂 I can’t wait! Hi Jenny. I’m glad I could help with you catch the travel bug! Who took the picture of The Golden Pavilion?! I had never been to Japen before. I took the picture. I think you should put Japan at the top of your travel hit list. It’s an amazing country. There’s so much to see and do. I hope John and I get a chance to go back sometime in the next year or two. O wow, that is a great trip. I’ve visited Nara too, and Osaka just for one night (the food, the neon and the street life!). I would love to see more of Osaka and Japan in general. Thats an amazing picture of the Golden Pavilion. I had once seen a pic of the pavilion before but that didnt give me a feel that it was so amazing but the picture you have posted proves that its truly fabulous. I regret I haven’t had possibilities to admire such a beautiful spaces live. Japan is far away but luckily there is a place in Poland which looks like Japanese Garden. Friends of mine were there about 3 years ago and were delighted. Your shot is great. However I wish I would see more. Is there any chance to see more pictures from Kyoto’s Heavenly Golden Pavilion on your flicr? We felt the same way about Osaka. What a great city. I thought the women in Tokyo had a wicked sense of fashion, but the ladies from Osaka can sure give them a run for their money! Hi Carrie and John. Belated happy birthday carrie, to be 29 again. You look marvelous, simply marvelous. Great photos and articles. Lovely photo! I’ve been to Tokyo but I’m dying to visit Kyoto! Kyoto is certainly a special place, but then again, no city in Japan resembles another. They all beat to a different drum!